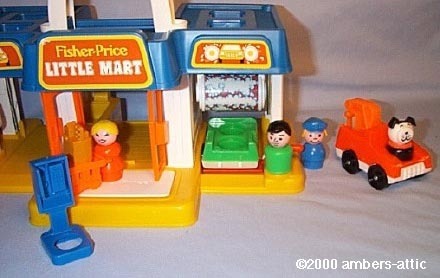 Description: This is a one-stop shopping mart with a clicking gas pump, a car wash, a tow truck service complete with a truck, and a convenience store for the Fisher-Price Little People! The store has automatic doors, a cashier counter, and an accessory shopping cart and bag of groceries! The hardest pieces to find in this set are the shopping cart and shopping bag, fetching more by themselves than the rest of the set is worth. These pieces are not only exclusive to this set, but also a bit odd-looking and probably the first pieces in the set that a child lost. 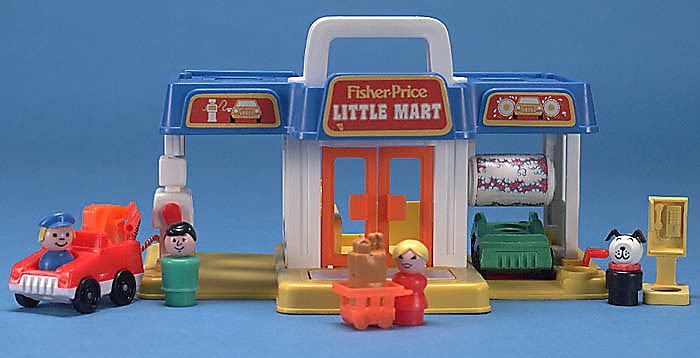 The Little Mart is unlike any of the other Little People sets. It is not only one of the smallest and most lightweight sets, but also one of the smallest to have so many exclusive features, such as the automatic doors for the convenient store, the car wash roller and automatic car release, and clicking gas pump. Exclusive pieces are the shopping cart, grocery bag, and tow truck. B2580A - Small white plastic Little Mart with a grey base, and no back wall on the store. *See "Variations" below. FPT275 - Red top, white base 1-seat tow truck with an orange plastic tow hook on the back. FPT623 - Green top, green base 2-seat car (front-to-back seats) with slightly raised "fins" on both sides of the back seat. 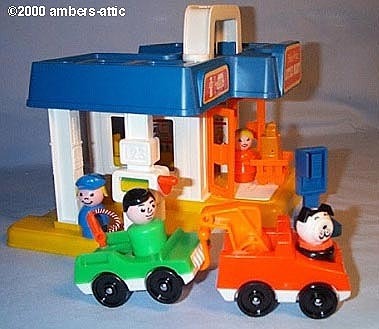 The car has a gas hole on the back corner, a tow hook hole under the front bumper, and is marked "©1969-1987 FISHER-PRICE" on the bottom of the car. The car rolls on 4 black smooth rolling wheels with metal axles. The wheels are NOT marked. *See "Variations" below. FPT1026 - Small orange shopping cart with handles that are rounded for a Little People figure to lean against. There is a hole in the center of the cart. The hole is sided to hold either a Little People figure or the FPT1027 grocery bag. The wheels do not really roll. FPT1027 - Small rounded tan hollow plastic bag of groceries. The base is the same size as a Little People figure base, and fits into the hole in the FPT1026 shopping cart. The top of the bag has molded grocery items, such as a carton of eggs and milk carton. FPT247 - Yellow rectangular plastic "open" style payphone with a molded payphone and receiver handset on one side. The phone is mounted on a wide post with a square base. The base has a hole on the front for a Little People figure to "stand in" while "talking on the phone". *See "Variations" below. CJPP - Green man with molded black molded plastic hair. GGPP - Light red mom with a blonde bun. *See "Variations" below. 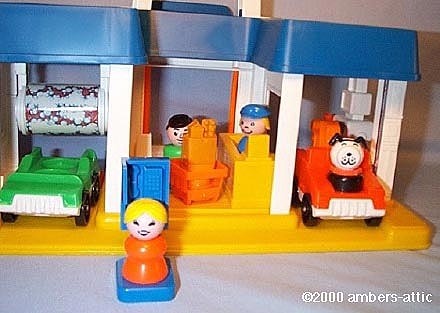 FLPP - Blue girl (tow truck driver) with a blonde bob with bangs under a blue hat with an inverted "U" above the bill. HWPP - Black body dog with a red collar. The collar has lines on the outside edges. B2580A - Small white plastic Little Mart with a grey base, and no back wall on the store. 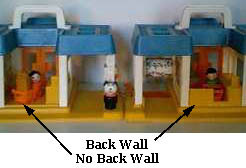 B2580C - The base was also available with a grey base, and WITH a yellow half-wall on the back side of the store. B2580B - The base was also available with a yellow base, and no back wall on the store. B2580D - The base was also available with a yellow base, and WITH a yellow half-wall on the back side of the store. FPT277 - Blue top, blue base 2-seat car (front-to-back seats). The wheels are NOT marked. FPT860 - Green top, white base 2-seat car (front-to-back seats). The wheels are NOT marked. FPT245 - Blue rectangular plastic "open" style payphone with a molded payphone and receiver handset on one side. The phone is mounted on a wide post with a square base. The base has a hole on the front for a Little People figure to "stand in" while "talking on the phone". GOPP - The red mom can have a dark red body and a blonde bun. This set was sold in a 13-1/2" long, 9-7/8" high, 8" deep box.